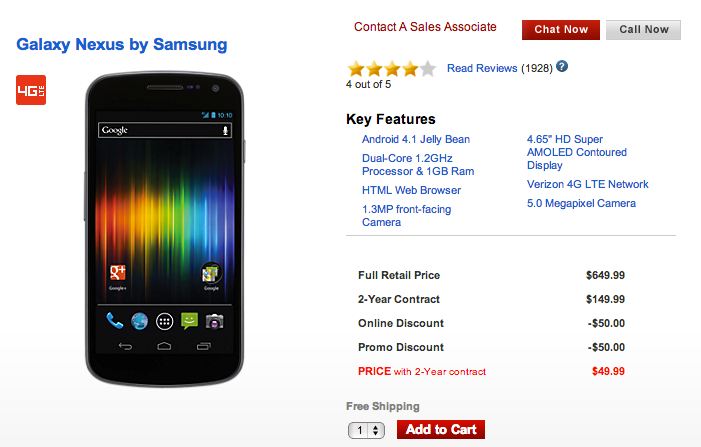 Still contemplating the purchase of a Galaxy Nexus on Verizon? How does $49.99 sound? Big Red appears to have dropped the price to that today after adding a “Promo” discount on top of a long-standing “Online” discount. We don’t necessarily think that this means a replacement phone such as the Galaxy Nexus 2 is on the horizon, but is instead a sign that Big Red is cleaning house to make room for the Galaxy Note 2, RAZR HD (and MAXX HD), Spectrum 2, Lumia 920, HTC 8X, and of course, the DROID Incredible X – all of which should be available by the end of November. The Galaxy Nexus remains one of my favorite phones of all time even with its atrocious battery life. You just can’t beat the developer community that comes with a Nexus.